Merula olive oil - Organically grown, Merula olive is produced at the Perales de Valdueza estate in Marida, Spain. Merula is a distinctive blend of four olive varieties: Arbequina, Hojiblanca, Piqual, & Morisca. Merula is fruity & slightly tart with notes of apple & spice. A rare element of the blends in Merula, the Morisca olive was nearly extinct when the Marques de Valdueza & his adviser, the well-known oleogue, Dr. Cristino Lubillo, decided to recuperate it as a fundamental element of the blends produced on the Perales de Valdueza Estate. In January 2007 Merula scored an 8.2 out of 9 possible from the Cordoba tasting panel, recognized by the International Olive Oil Council. This new olive oil is gaining attention of both professional & home chefs & is packed in an award winning tin. "Merula" means "blackbird" in in Latin & is named for the blackbirds that fly around the Marque's estate. Merula is an affordable all-purpose oil & can be used in lieu of of butter when frying eggs, mashing potatoes, dressing vegetables, preparing vinaigrettes & for dipping bread. A pleasant surprise! 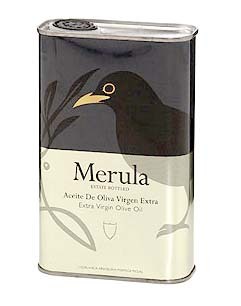 Merula Extra Virgin Olive Oil / Tin. Size: 17.5 oz (500ml.) tin.